Whaling City Golf Course is a 6780 yard 18 hole championship course; with several remaining Donald Ross designed holes. Originally called New Bedford Public Links; the course was built by Buster and Stanley Brown in 1947. The course has undergone major transformations and been redesigned over the years as civilization progressed; making alterations as route 140 and 195 were built. The land continues to be assessed for other uses; but as the golfers who have played her for 50+ years will attest, it will survive. Public welcome; league times available; outings welcome. 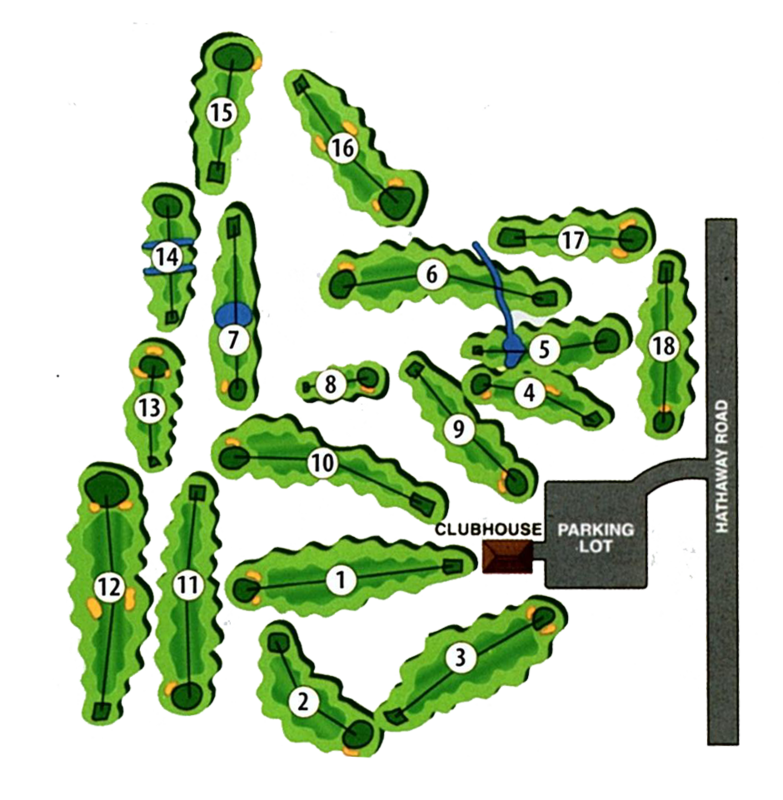 With four sets of markers ranging from 5233 yards to 6780 yards, the course will satisfy all levels of golf ability. Located on a secluded parcel of land; with many types of wildlife to view, and no houses or developments seen from the course, your round will be a golfing experience as in time gone by. On 1: Inside edge, at ground level of telephone poles supporting practive area netting. On 2: Fence on right. Fence mesh is part of boundary 2 club relief must stay in rough. On 3: Telephone poles plus white line on cart path left rear of green and cart compound area. On 10: Stone wall on left. On 16: In or over the ditches left and right. WATER HAZARDS: Indicated by yellow lines and stakes. LATERAL HAZARDS: Indicated by red lines or stakes. #4: Lateral hazard right side. #5: Water hazard, ditch on right, lateral. #7: Lateral, right side ditch to pond, plus regular water hazard. #8: Water hazard ditch between tee and green. #14: Water hazard, ditch before island, ball entering pond, on left on a fly must be played over again. (Penalty if the ball bounces off island, play point of entry.). Lateral right side of pond to green.